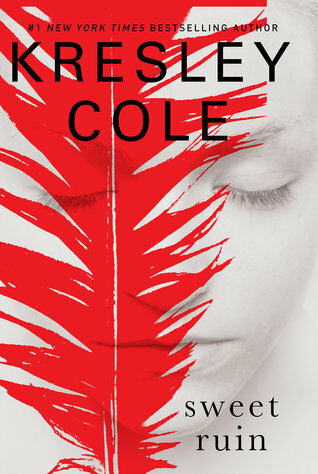 Sweet Ruin by Kresley Cole is the newest book in her Immortals After Dark series. A threat to the Morior has brought archer Rune the Baneblood to the mortal realm to slay the oldest living Valkyrie. Whether by bow in bed, he never fails to eliminate his target. Yet before he can strike, he encounters a vampiric creature whose beauty conceals a black heart. With one bite, she pierces him with aching pleasure, taking his forbidden blood- and jeopardizing the secrets of his brethren. Could this exquisite female be a spy sent by the very Valkyrie he hunts? Rune knows he must nor trust Josephine, yet he's unable to turn her away. Despite his millennia of sexual conquests, he can't ignore the unfamiliar longing she arouses deep within him. When Jo betrays the identity of the one man she will die to protect, she and Rune become locked in a treacherous battle of wills that pits ultimate loyalty against unbridled lust. 1. I still love this series after so many books, because Cole keeps the plots new and interesting. She is always pushing the overall story line forward that makes me believe that there is an ultimate goal that will be accomplished. 2. I love that she can still make her all her main characters unique from the others. I have read too many of these longer series that the leads have so much in common that it gets hard to remember who is who, and they all start to feel the same. Rune and Josephine definitely stand out from the other lead characters in the series. Rune walks the line of villain, but somehow I really grow to like him. Josephine is a strong and independent woman who knows what she whats and is not afraid to admit it. 3. Part of my liking the book is the mystery of what kind of immortal is Josephine. Her growing up in the human world with no contact with the Lore gives her a unique position. I enjoyed seeing the pieces come together and seeing her remember her past. The other part I really enjoyed is the introduction of the Morior. It will be interesting to see what part they will play in the Accession and Nyx's plans.